Yesterday morning started out grey, but unexpectedly dry. After several cups of coffee, some last-minute preparation, and lots of indecision about glove choice, I got out the door and down to Recyclistas and the Switch Bridge for registration. 24 racers started, with an always fascinating array of competitors. A good portion chose cross bikes for the day, with a handful on road bikes. 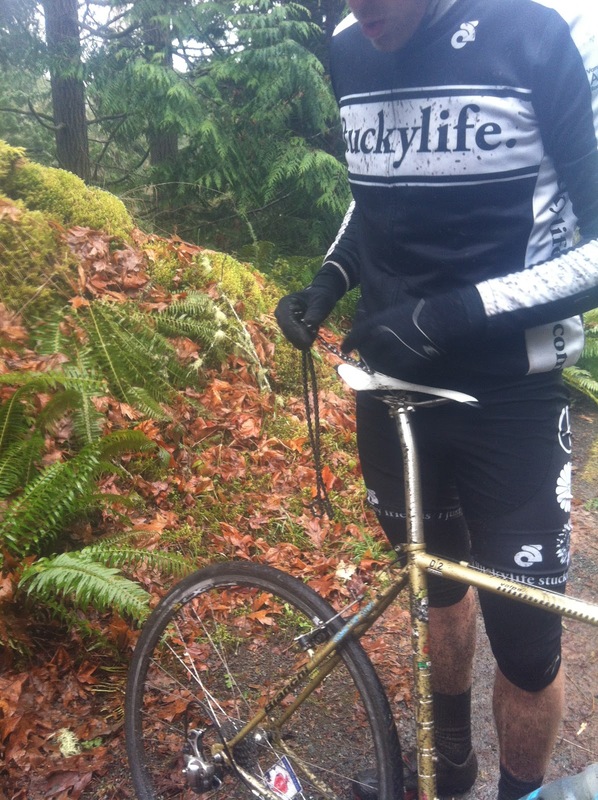 A couple of bold SSCXers, and two gallant brakeless track bikes. A rolling start saw racers through the first 16 km of trail, providing time to strategize, chat, and check out the competition. As soon as we were across Veterans Memorial, it was game on. Dan Leonard, in Iron Man training form, latched himself onto the front and motor paced us up to a steady 40km/h. Road crossings and dog-walkers came fast and often, both dispatched with courteously and quickly. As the group charged through Metchosin, feeler attacks were thrown off the front, and just as quickly snapped back. From mid-pack, Halldor's stampede down the outside was stymied pretty quickly by an outspoken woman walking with her horse. Interesting race dynamics. 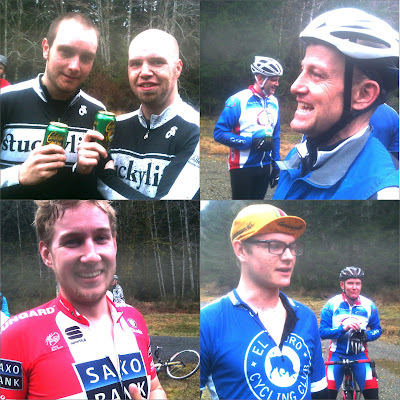 This being Team Stuckylife's first organized race (In full kit! ), tactics had been enthusiastically discussed beforehand. We intended on dropping either Halldor or Geoff Robson into a sprinter's finish at the line. In the ensuing crazyness, things went vaguely according to plan. Perhaps from a desire to 'animate the race', and knowing that in a sprint I would end up firmly mid-pack, I threw in a couple long digs after Dan started to fade, and at about 25km to go, jumped, and got a gap on the peloton. In an audacious push, Geoff made his way up to me. Alternating pulls we put time into the pack as the race passed Matheson lake. Just when I was starting to crack, Scott Martin, Dawn Anderson and Jamie Cameron made it on to our wheel, and the race really started. So did the rain. 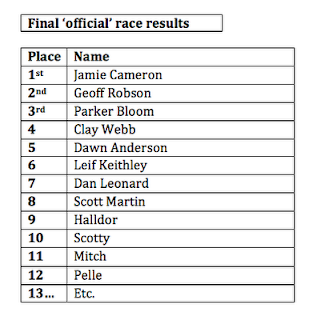 Going into the race, Jamie was a clear favourite for the win. In addition to superhuman cycling capacity, the Leechtown course suits him, and he knows his way around a road race. Having him off the front with me was a benefit to my team's race, if I could get him to work and tire himself out. But if we stayed away for too long, he'd cream me at the finish. It must have been at this point that Mitch's spectacular crash occurred, allowing us a larger margin, and keeping the pack out of sight. The goose past Matheson Lake and into Sooke is a windy path, never allowing enough vantage to know whether the chasers are closing in or not. Dawn lost contact, and the four remaining pulled together, with Scotty and Jamie steadily working hard to keep the peloton at bay. Geoff played by our team plan and stuck behind my wheel, staying fresh. More drama. Scotty, a strong rider, and definite contender in a four-up sprint, pulled off with a flat rear tire, leaving three of us. At this point, I think we all knew we had a big enough gap to finish the race at the front. And I knew that I had to have Jamie tired if Geoff was going to have a chance to come around him and take the win. Pretty relentlessly (seriously, I can hardly walk today) I attacked throughout the last 12 or so km, letting Jamie take a few turns up front, but really making him work to keep me close. I wasn't sure whether he knew I was trying to burn up for Geoff's win, which perhaps worked to my advantage. A little kick on the wooden trestle and I got a gap. And then I imploded. Legs cramping, blurry vision, that kind of thing. About 4 km to go, they came around me, and Geoff offered a heartfelt 'thanks', patting me on the back, and pushing me into the ditch in the process. Like over my handlebars, bike-on-it's-end-in-a-tree kind of thing. Drama. I'm telling you, we were treating this like the freaking Forest of Arenberg. My legs were cramping so bad I couldn't stand, Geoff was distraught, worried for my bike, looking me over, and I kept yelling at him to keep racing. Platoon-style. Jamie, the gent that he is, had slowed up a few hundred meters ahead, and soft pedalled until Geoff caught back on. Into the final kms, it was head to head, until the clearing and reception party came into view. Jamie, cool and collected, won the charge to the line, finishing a wheel's length from Geoff. Badass. After I finished, dragged myself off the bike, swearing, bitching and cracking open a beer, the results came in. Clay in a dramatic final few km maintained his long break and came around Dawn just down the path from the line. Fourth. Dawn, after a phenomenal chase towards our lead group, hit a serious bonk with only a few km-markers to go, but finish shortly after Clay to round out the top 5. 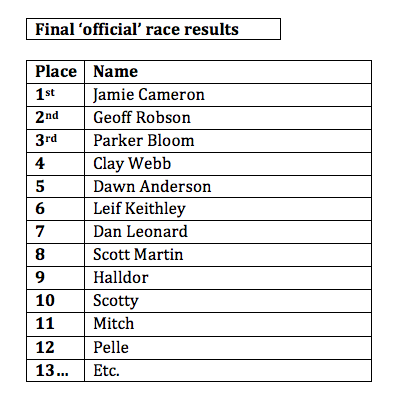 The final five spots of the top 10 were all hotly contested into the final stretch, with Leif leading in 6th, Dan finishing a strong TT in 7th, and Scott with newly changed tube in 8th. Fresh off of a monster pull, and subsequent flat tire, on behalf of Regan, the second real sprint of the day was won in fine God of Thunder style by Halldor. Just edging out Mitch and Scotty, with Pelle a bike length back. Jamie's first place prize, a case of beer, was quickly emptied, as we all traded stories, inspected damaged equipment, and caught our breath. Credit must be given to the day's lantern rouge, Eiry Bartlett, who insists she wasn't officially racing, yet made Malcolm work to keep her off his wheel. The true hallmark of these grassroots events are the things you can't plan. 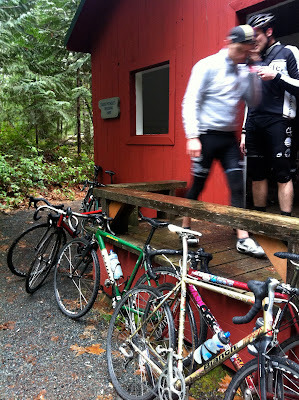 Like the Achuff brothers greeting weary riders a little ways down the trail, set up in a red hut with hot coffee, burgers and chocolate. The ride home was wet. And fraught with disaster. 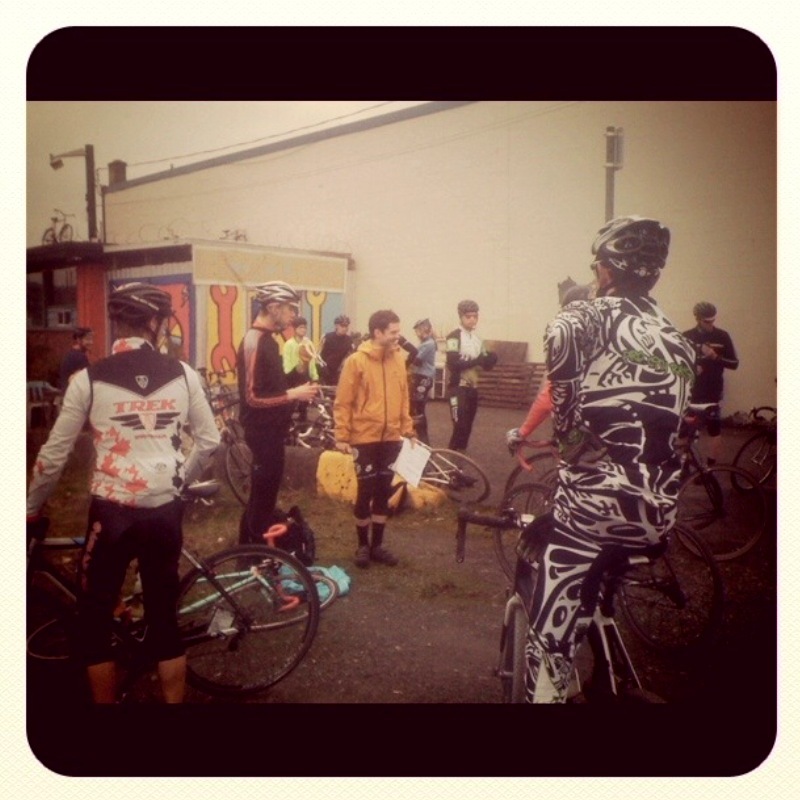 Flat tires, broken chains, too much beer and too little food. I'd like to thank Angus for his no-questions-asked commitment to being race support, and to Michael Achuff for providing a stellar cup of espresso after it was all over. As always, these events do not happen without all of you coming out to race. Thanks for making this one awesome! 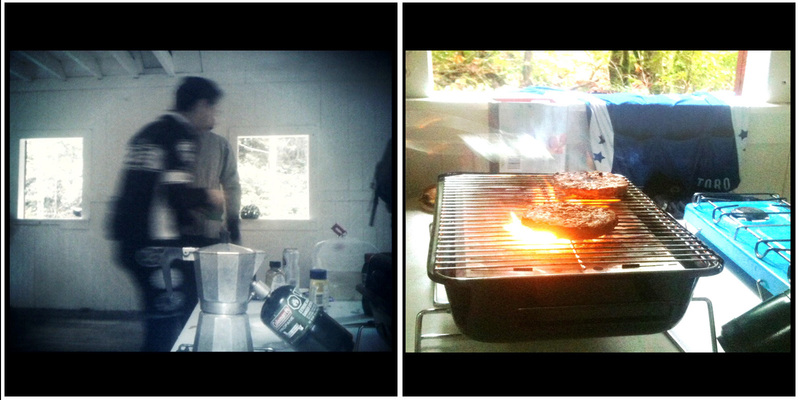 Thanks to Leif, and Clay, and Regan whose iPhone snaps, along with a few of mine, are spread across this post. 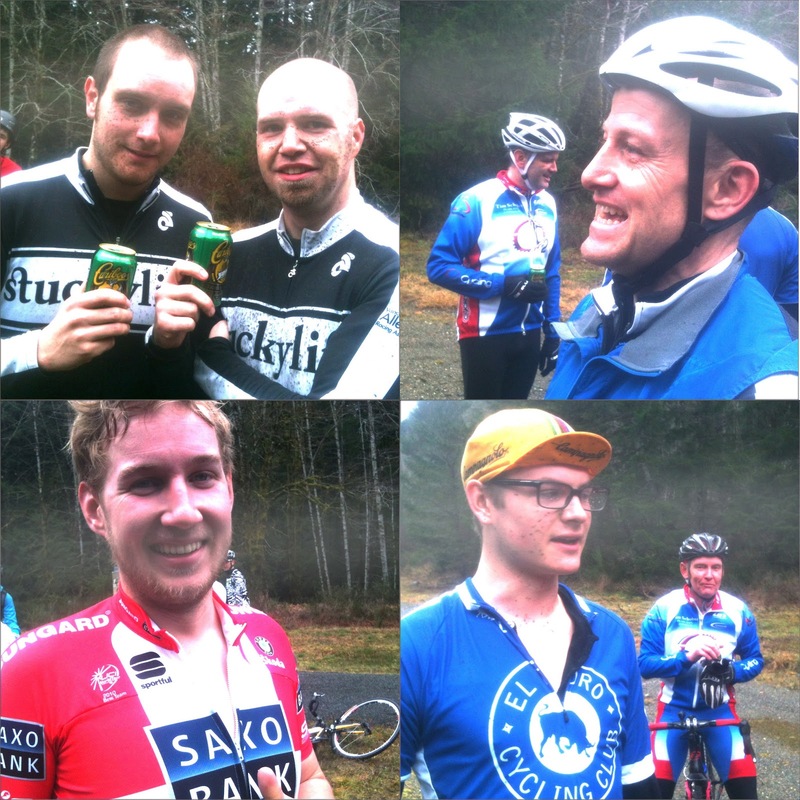 Looks like everyone had a great time, thanks for organizing. I missed out since I doubled back to pick up a buddy who was late. FYI, since we chased a few min back of the group for awhile we came across a couple of genuinely terrified families. Did not make me feel good. Crack of dawn or night event might be a better idea. Judging from the reaction we get from people when we put on alleycat races at 7pm, dusk does not help our cause. Thanks for the feedback, though. This is all good to know. Presumably that is around town though. Odds of horses & families out on Goose after dark seems far slimmer than 11am on a Sunday. Anyway, glad everyone had a good time - keep having fun. How do I get involved/race in these? Easy! Keep an eye open for race & ride announcements on our Twitter/ Facebook/ Blog HQ. Stuckylife news at 9. The Island's best source for unsanctioned, over the top bike racing.